Check back soon or visit the Calendar of Events for upcoming webinars. Welton Hong of Ring Ring Marketing covered how to generate positive reviews in a respectful and thoughtful way. He also covered how to mitigate the damage of negative reviews, how to deal with fake reviews, and which review sites are most important for success. Ashley Montroy of FrontRunner covered how to use social media as a powerful tool to share a funeral firm’s story and educate, inspire, and connect with families—long before they need services. Montroy offered a behind-the-scenes look at 100+ funeral firms on Facebook to show exactly what works with families. Are Consumers Finding Your Firm? Discover Google's 2018 Consumer Funeral Online Search Insights & Get Competitive! Murray Levine of Internet Ad Pros shared Google insights on how consumer online searches for funeral services has skyrocketed in 2017. Leverage this knowledge and help consumers find your firm. Addressing objections, in both preneed and at-need settings, is an important part of the service you provide. Co-hosted by Homesteaders' Regional Director-Strategic Markets Justin Baxley and Director-Training & Development Wanda Sizemore, this webinar offered a comprehensive overview of the most common consumer objections, the motivations behind them and the most effective ways to respond. Click here to access the recorded webinar and click here to download a free script for overcoming objections. Selected occasionally hosts webinars, giving members the opportunity to learn about a specific topic from the convenience of your home or office. 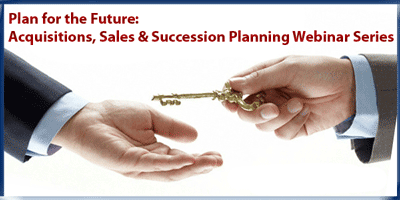 Join us for the next three-part webinar series focused on Succession Planning. Chris Farmer of The Farmer Firm and Tim Bridgers of Live Oak Bank join together to bring you insight into how to set your firm up to maximize its value in the days, months and year ahead of potential sale or generational transfer. Whether you are growing older without a younger generation in the business or you want to ensure your family or employees can access financing needed to "buy you out" when the time comes, Chris and Tim will offer their expertise in setting the groundwork for your succession planning strategy. If you missed this webinar, you can access it now by clicking here and visit the Succession Planning Toolkit for webinar slides. So the time has come to consider selling your firm, whether to the next generation, your employees, another independent, or a corporate firm. Most businesses have never done this before and don't even know where to begin. Chris Farmer and Tim Bridges return to walk you through the process and help you understand all the options so you can decide which is best for your business. How do you even start marketing your firm for sale? What does a common sale agreement look like and how do you negotiate it? What common mistakes do people make and how can you avoid them? Join this webinar for answers to these questions and more. Jake Johnson of Johnson Consulting Group joins us for the third segment of this webinar series. Jake will walk members through how to evaluate a funeral business as a potential acquisition target. What does a firm's financials tell you about the strength of the business and its value? How do you evaluate an existing preneed portfolio? How do you reduce your liability for past mistakes or errors? What common mistakes do acquiring firms make, and how can you avoid them? This session will get members up to speed on the ins and outs of buying a funeral business and provide insight on when this option may help your business grow and grow stronger.